To conduct a thorough QT study of levocetirizine, a non-sedating antihistamine, in accordance with International Conference on Harmonisation (ICH) E14 guidance. The study was designed as a single-dose, placebo and positive-controlled, four-way crossover, randomised trial in which 52 healthy male and female subjects participated. Levocetirizine (5 and 30 mg) and placebo were administered double-blind, and the positive control, moxifloxacin (400 mg), was open-label. Electrocardiograms (ECGs) were obtained by continuous Holter monitoring at various time points (three per time point) during a 24-h period at baseline and after each treatment. The ECGs were read centrally in a blinded manner. QT intervals were corrected for heart rate using a gender- and study-specific correction (QTcSS) and Fridericia’s correction (QTcF). 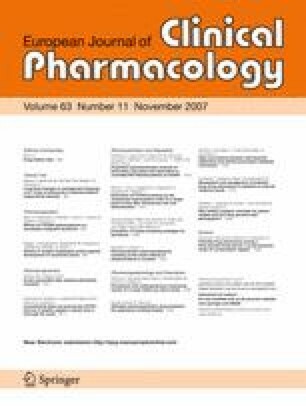 The largest QTc time-matched and baseline-subtracted difference between each active drug and the placebo (largest ΔΔQTcSS) was derived from a mixed-effect analysis of variance. The one-sided 95% upper limits of the largest ΔΔQTcSS for levocetirizine were 5.7 ms (5 mg) and 3.9 ms (30 mg), with mean estimates of 2.9 and 1.1 ms, respectively. Similar results were obtained for the ΔΔQTcF data. Statistically, moxifloxacin significantly lengthened the QTcSS, with a one-sided 95% lower limit of the largest ΔΔQTcSS of 10.5 ms and a mean estimate of 13.4 ms. There was no relationship between the measured ΔQTcSS and the plasma concentration of levocetirizine, whereas a statistically significant linear relationship was observed with the plasma concentration of moxifloxacin [slope estimate 0.004 ms/(ng/mL); 95% confidence interval: 0.003–0.005]. Overall, the results of this thorough QT study indicate that the methodology of the trial was valid and sensitive enough to demonstrate the absence of effect of levocetirizine at both therapeutic (5 mg) and supra-therapeutic (30 mg) doses on cardiac repolarisation. We are grateful to Shikiko Watanabe, Javier Sawchik and Mona Mihaela Troenaru for their aid in reviewing and analysing the results of this study, and to Dr Joel Morganroth for expert advice. We declare that the study reported herein complied with the current laws of the country in which it was performed.